If you’re an experienced or regular hiker, you’ll probably have most of the kit you need for a walking safari in Africa. 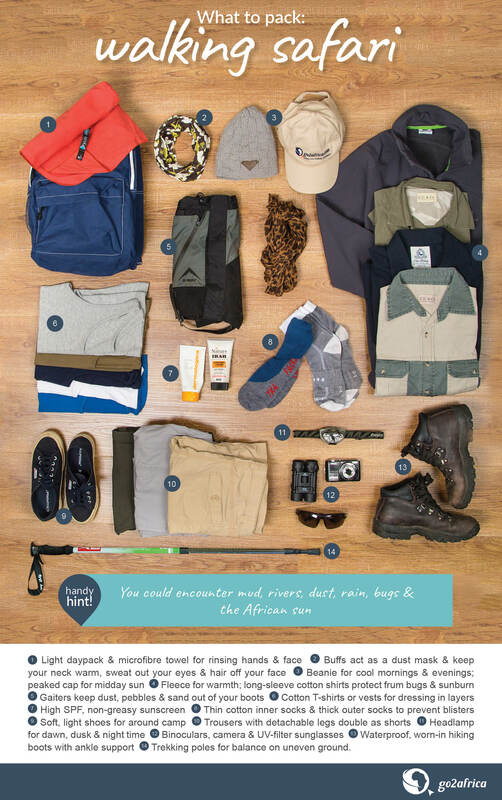 But even if you are a frequent walker or are a first-timer, use our handy infographic as a checklist to ensure you don’t leave anything behind when you’re packing – you can’t just drop past an outdoor store or camping outlet in the heart of the African bush when you realise you forgot your gaiters! Pack as lightly as you can. Although porters will be carrying your main pack from camp to camp and all you will be carrying is your daypack, most walking safari destinations are reached by light aircraft, which have strict luggage-weight limits. If you are going onto another destination after your walking safari, ask your Africa Safari Expert to make arrangements to have your extra bags stowed so you can collect them afterwards. Stick to the colours of nature. Back home your hiking or trail-running gear might be bright or luminous colours – you will make no friends in Africa if you wear shocking pink, purple or orange. Dress in greens, browns and greys so that you don’t scare off the game (but do not wear camouflage – it is illegal in many countries because you are falsely impersonating a member of the military). Avoid white (it’ll get dirty and there won’t be laundry facilities) as well as black and blue, both of which attract insects at night. Trousers that zip off at the knee to become shorts are very useful. Two trekking poles can be useful for balancing on uneven ground but practice with them at home first so that you can get your swing and rhythm right, as well as optimise the length of the poles. A headlamp is invaluable for moving around camp at night. Be sure to bring fresh batteries but only put them in the headlamp when you get here – if your headlamp is jolted during the flight and switches on by itself, much of the batteries’ power will be drained during the long-haul journey. Unless you are an experienced or professional photographer, keep heavy camera bodies and lenses to a minimum. Carrying a few pounds of extra camera gear quickly adds up on a hot day. A microfibre towel is very lightweight and dries very quickly. Bring the best-quality sunglasses you can find. The sunlight can be harsh in Africa so eye protection is imperative. Gaiters are the opposite of glamorous but they are extremely useful to keep pebbles, sand and mud out of your boots. And, about those boots, waterproof is best. You may have to cross streams and wet boots will be extremely uncomfortable, not to mention unhealthy. The most important one is sunscreen. Opt for a lightweight, fragrance-free, eco-friendly one if possible. The same goes for insect repellant – opt for the most organic one you can find. Remember that sharp or unusual scents will frighten off the game, which have far keener senses of smell than we do. As far as possible, choose biodegradable toiletries and keep grooming requirements to a minimum. A walking safari is the way to experience Africa the way our ancient ancestors did: time slows down, the world appears brighter and you will remember smells, textures, the little details and soaring feelings that had been long forgotten.